Hold Me Closer, Tony Danza - . Bottlebrush plants grow wild in my hometown. Their red, spiky flowers always seemed to thrive near eucalyptus. 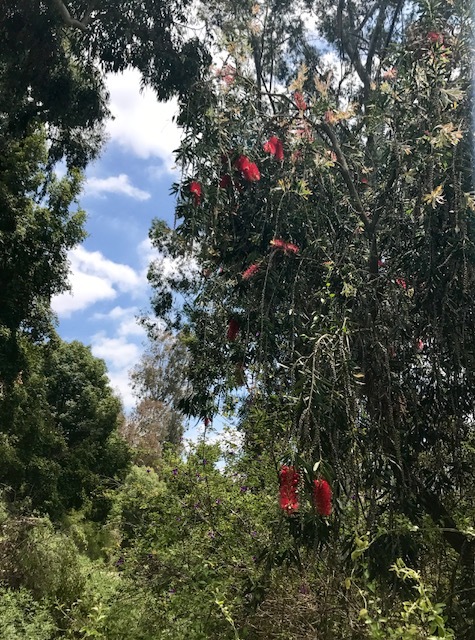 I remember a distinct moment when I began working in a restaurant in Hollywood, there was an actual bottlebrush behind the bar, the round kind of brush used exclusively for washing bottles. I looked at it and thought, "Hey, that looks like a bottlebrush plant." Beat. Beat. Beat. "Oh." It was just a few months ago when it occurred to me that Tony the Tiger (of Kellogg's Corn Flakes fame) says "Grreat!" Because he's a tiger and tigers say "Grrr." Oh. Dear God. What else didn't I know? Bob uses a piece of baseball training equipment called the Velo Pro. Yeah. "Velo" is not a family name but is short for "Velocity." Oh. The big indoor stadium in downtown Los Angeles is the "Staples Center" because one of the original owners (with naming rights) was the Staples office supply company. Not a family named Staples. But a company that sold office supplies that was also named after an office supply. Oh. Yes, there are more stories such as these, many of them involving misunderstood song lyrics. There's Manfred Mann's 70s classic Blinded by the Light, anyone? "Wrapped up like a douche when you're rollin' in the night." ("Revved up like a deuce, another runner in the night.") Oh. And to add to all of this- Bruce Springsteen wrote Blinded By The Light. I am constantly amazed at the things I should know and do not. If it's not "douche," then I don't even know who I am anymore.